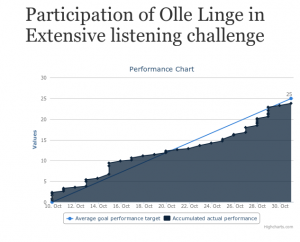 This is the last day of the extensive listening challenge that was started three weeks ago. It was the first official challenge on the new section of this site: Hacking Chinese Challenges. In total, 139 people joined the challenge and listened to a total of 924 hours of audio. That’s amazing! What do you think about Hacking Chinese Challenges? What interesting listening resources have you found? Let’s look at these questions one by one, but I want to mention now that there will be prizes offered for the third question! I can’t answer this question for you, but I have read many comments where participants say that they have increased the amount of Chinese they listened to this month enormously because of the challenge. That’s great! 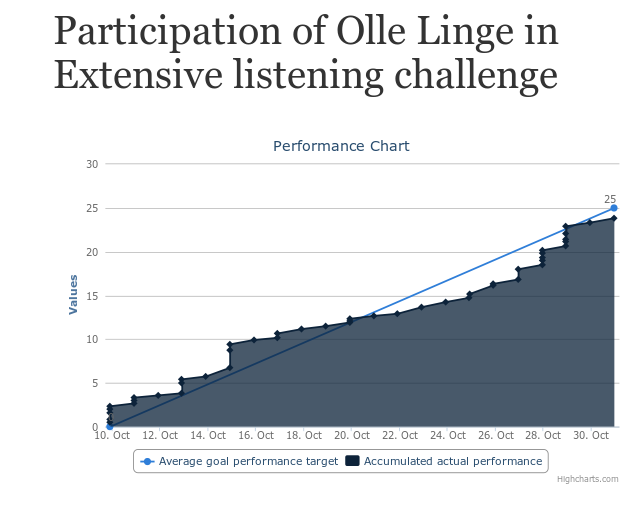 I set the goal of listening for 25 hours, and as you can see in the graph to the right, I was losing momentum after the initial stages of the challenge (which I also mentioned in my progress report). It took a while to sort things out, but by moving more audio to my phone, I manage to listen a lot this week. What does your progress look like? Did you reach your goal? If not, what would you change to make it possible next time? Not reaching your goal isn’t necessarily bad, you might just have set an unrealistic target. As long as you have listened to a lot of Chinese this month, you have reason to feel good about it! To be eligible, I need your contribution before November 9th and you need to post a resource that hasn’t already been shared either here or on Hacking Chinese Resources. I’m looking forward to hearing about your listening challenge and what material you used! The next challenge will start in early November and will be about extensive reading. I will of course write more about this later, but if you want to sign up now, you can do so here. I loved to watch this 2 part documentary called “冰冻星球” “Frozen Planet” . Suitable for intermediate to advanced. Having some geography,temperature, animal vocab up your sleeve helps, but it’s easy to follow without understanding all vocab (which I didn’t! ).The cinema photography is amazing. I thought it went quite well. The only suggestion I’d make for the future would be to change the Leaderboard from ‘Hours spend listening/on challenge’ to ‘Percentage of goal accomplished’. That would make it more relevant and equal, rather than just who has more time to devote to the challenge than everyone else. I planned for 10 hours, and did just under 11. I used a lot of materials from jw.org, which has stuff in about 700 languages with many audio and video files. I also used other stuff, but this was a major source. Thoroughly enjoyed this challenge, as I have been neglecting my listening time as of late. I do watch 2 chinese soaps a day, but I don’t count that as I’m also reading the hanzi subtitles at the same time to reinforce what I’m hearing. For this challenge I went through all the Chinese Breeze 500 word level audio recordings, as well as Graded Chinese Readers 1,2 & 3 audio files. Also listened to ChinesePod and iMandarinPod podcasts daily, without looking at the pdfs. My listening ability improved over the last 3 weeks, and I plan to add at least a half hour of listening to my daily study time. I look forward to the next challenge! Went pretty well, lost some time at the end cause I had to cram some history..
Made a goal for 20h, ended up on 16h. Perhaps my goal was a little to high since I knew about the exams..
and the free clips of ActiveChinese on Youtube. The material is for beginners, like myself. The Spotify material is “learn in your car audio lessons : Mandarin”. Some useful phrases and words basically. The free clips on ActiveChinese are conversations which are displayed with a cartoon. These are perfect to download and put on your phone. Thanks for these beginner resources! I hadn’t seen Active Chinese and I like it quite a bit. I’ve enrolled just a few days before the end of the challenge. The only act of subscribing has had the effect of increasing my time devoted to listening (honestly usually very little) and this is fantastic. It means challenges are powerful tools for having you act and accomplish goals. Yet I’ve found pretty complicated to update my daily results having to sign in every time and being asked to reenter my goal, not finding my past results. Has anyone encountered the same issue? I’m sure I am missing some information. Thanks for the great work and ongoing help! Although I can understand why you don’t allow people to record their times more than a week afterwards it is a little disappointing to see on the scoreboard that I failed to reach my goal even though in real life I made it but was tardy in reporting the daily totals on the site… For some reason Firefox “save password” feature only seems to save the password for me on the Challenges page and not my username, so a little bit of a hassle to log on frequently. Intro: Although listed in Hacking Chinese Resources as a Reading resource each China Breeze book comes with a companion CD containing mp3’s of each chapter read aloud (normal speed plus a slower version). As graded readers the China Breeze books use relatively high frequency vocab providing good comprehensible input for beginner listening practice especially if you’ve already read it. Intro: Each book (one for each level of the new HSK exam) contains ten practice exams including a companion CD containing mp3 of the audio portion of the test. After taking all the practice exams you may extract further value from the book by using the “Truncate Silence” effect in Audacity on mp3 files to get rid of the pauses in the audio portion of the test and use the resulting audio as listening practice. Although notoriously harder than the corresponding offical HSK exams, these simulated exams still feature many relatively high frequency vocabulary dialogues providing good comprehensible input for beginners. Thank you for the recommendations! I have added the resources to Hacking Chinese Resources and will randomly give away the posters once I have collected all eligible answers. I also added the audio tag to Chinese Breeze. Downside of that link was not being able to download it. But it was dramatized which was great for conversational listening. I think if I could get some things on my phone this would help. Also I restarted lessons with Serge Melnyk, which is a great resource that I’m pretty sure I heard about here on Hacking Chinese. 1) How did the challenge go for you? Although I only managed 3/4ths of my 20 hour goal, I was quite pleased with the amount of listening that I got in. It was certainly more than I usually do, and I’m getting the sense that I am understanding a bit more than before. My listening skills are still quite poor – partly due to a small vocabulary, but also to difficulty distinguishing tones. I did some transcription during the challenge period, and I think I am improving a bit in this area. 2) What do you think about Hacking Chinese Challenges? Great idea. Nice to have some extra motivation to work on a specific skill. I liked being able to view my progress and to check out what others are doing. My one gripe is that it took quite a while until I could reliably find the actual challenge page where I could report progress etc. (You had to click the title and that wasn’t obvious to me). This is a great question, and I’m looking forward to reading other people’s answers. I have been learning Chinese now for – I dunno – 700 hrs? but I still feel like a beginner, and I had trouble finding good listening material. What worked best for me was listening to my textbook cds, and also to the cds of another textbook that I have but am not using. Most everything on the net was either a) too hard for me or b) too littered with English. One that found a good compromise for my level was “Travel in Chinese,” which is designed for intermediate students, and although it was too hard for me to understand the dialogues the first time through, I could pick up some of it, and understand most of it after the explanations. Introduction: China Central Television has produced content for learning Chinese. It can be streamed from their website. There are shows at the beginner, intermediate, and advanced levels, but the content might be more difficult than what you might expect for those labels. Introduction: There are 100 episodes, structured like a course, with increasing levels of difficulty. Each episode has a few minutes of Chinese dialog and is about 15 minutes total. The bilingual host (American English and Mandarin) analyzes the dialog and teaches essential words, phrases, and grammatical structures. The more difficult structures are reinforced with animations depicting additional use cases. I’ll write about my overall experience in another post. I just wanted to post this now. Thank you for the recommendations! I have added the resources to Hacking Chinese Resources and will randomly give away the posters once I have collected all eligible answers. I find the Hacking Chinese challenges very motivational. I knew listening was important but I was doing almost no listening outside of my Chinese classes. As a result of the challenge I have made a new habit of listening to Chinese almost everyday. I found a lot of songs on you tube that I downloaded to my ipod. I just searched for the type of songs I like and “Chinese”. I also listened to a number of simple podcasts. I found the Bible in Chinese on http://www.Bible.is and occasionally listened to this. However, I found it was at too high of a level for me to understand. Thanks for organizing these challenges. I’m already looking forward to the next one! Thank you for the recommendation! I have added the resource to Hacking Chinese Resources and will randomly give away the posters once I have collected all eligible answers. One of my favorite resources to practice listening is Tudou, basically a Chinese version of YouTube. If you are using Google Chrome you can download an extension to play it in the US. I would highly recommend it for any listening level. You can find full seasons for any TV shows, full length movies, music videos, cooking shows, anything your heart desires. I found it as I was struggling to find more resources for listening that weren’t purely podcasts. I appreciate Tudou for it’s variety and it’s certainly what helped me in accomplishing this challenge! I really enjoyed the challenge. I am a lazy language learner, so I derive a lot of benefit from having external pressure to keep me going. It definitely helped keep me motivated to seek out new and different (and better) listening material. Finding material was the hardest part for me. My level is somewhere around upper-beginner, so there isn’t a lot of content that I can easily comprehend and actually enjoy listening to. I found that I basically had to listen to things that were mostly beyond my comprehension and just let the language flow over me, occasionally focusing in on the little bits that I did understand and then listening carefully to see if there were any new words that were clearly pronounced so I could either look them up, or whose meaning I could glean from context. Extensive listening wasn’t part of my routine before this challenge. I was already enjoying listening to old “Elementary”-level podcasts on Popup Chinese, but that was about it. Because of the challenge, I will probably be more likely to include extensive listening somewhere in my weekly routine. Thank you for that. I am looking forward to future Hacking Chinese challenges! Intro: This is a free simple site with about 300 recordings that has a nice user interface that provides a lot of resources on each song page and it cues to the music well. The Pinyin is visible and there is also a Pinyin typing drill to match characters. I like many songs and can listen to them repeat without getting bored. Each songs character set can be studied with a simple drill and there are biographies of the artists and cross-linked lists by difficulty level. The social commenting aspect seems to be unused which is too bad. Great resource – thanks for sharing!